Over the last century, the use of the electromagnetic spectrum has undergone a monumental change. What was, at the end of the 1800s, an unregulated, sparsely populated band of electromagnetic waves has today become a highly regulated, extremely saturated region. 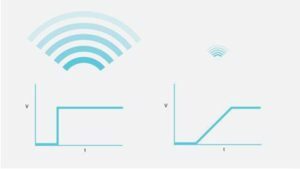 All wireless communications today need to fit into their appropriated portion of the spectrum, whether it is for television, cell phones, military communications, or amateurs. In the United States, the Federal Communication Commission (FCC) was formed in 1934 to regulate all wired and wireless communications and as a part of that regulation, they require testing on certain products. This ensures that the products have achieved electromagnetic conformance (EMC), indicating conformance with the requirements mandated by the FCC. If a device, whether intentionally radiating or not, is encroaching into certain bands and creating interference, there can be serious performance issues and legal consequences. Each country has its own entity, similar in function to the FCC, that has its own unique requirements and thresholds. It is essential to understand the concept of electromagnetic interference (EMI), know what the conformance tests for your market entail, and see if your products require them. You may sometimes hear the terms EMC and EMI used interchangeably; however, they are distinctly different. 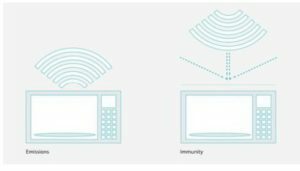 Electromagnetic interference is an occurrence that describes the radiation of electromagnetic waves and the effect on the recipients of those waves. This interference can be purposely generated by man-made objects, such as radios or wi-fi, or as an unwanted byproduct, such as spark generators in cars, or by natural phenomena, such as lightning or solar wind. EMI, at its most basic, is the result of voltage or current changing quickly and, as a result, creating spikes of radio energy. EMC, on the other hand, is simply a reference to whether or not a product acts appropriately when dealing with EMI. For our purposes, EMC will refer to conformance to FCC’s Part 15. Most consumer products fall under Part 15 as it is specific to products that emit electromagnetic energy but do not require a license to operate. There are a series of tests which confirm that the emissions are within limits as well as separate tests to confirm the operation of the device under extremely harsh electromagnetic conditions. These tests are performed by accredited third-party companies on behalf of the FCC in controlled lab environments, special testing chambers, or in very remote open air locations. 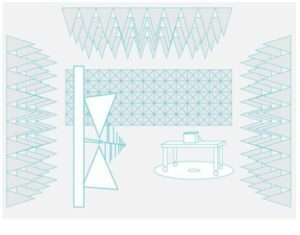 The facilities that are used for EMC testing fall under one of two categories, an anechoic chamber or an open area testing site (OATS). Anechoic chambers are specialized chambers that vary wildly in size with the smallest chambers being approximately 3-meters square with the largest at over 20-meters tall and 80- meters long, capable of fitting full-sized cargo planes. They are lined with special materials that absorb electromagnetic energy, effectively isolating the device under test (DUT) from external sources. For emissions, this allows sensitive detection equipment to detect the output of the DUT without the concern of contamination from external sources. For immunity, it also allows greater control over what the DUT is subjected to while also providing a shield for the testers against the high powered emissions. OATS are falling out of favor as they generally provide less favorable testing conditions. Testing is weather dependent, and there is no shielding during immunity testing, which requires a special license for operation. When testing emissions, either in an anechoic chamber or an OATS, the DUT is placed on a table and set up in the least optimal conditions. The intent is to create the greatest amount of electromagnetic interference that the DUT is capable of, which depends greatly on the product. For example, for memory chips, the chips are run to read and write as quickly as they can, forcing the greatest changes in voltage and current, therefore creating the greatest electromagnetic radiation. Once the DUT is ready, the table starts to spin while an antenna, a set distance from the DUT slowly moves up and down, mapping the electromagnetic output at different orientations and heights. The peak output recorded must be below the guidelines for the device to pass. This test can be done at different distances, dependent on the frequency range being measured, but 3-meter and 10-meter distances are most common. For testing immunity, the DUT is remotely operated while being subjected to large amounts of EMI. Typical values are from 3 volts per meter to 10 volts per meter from a minimum of 3 meters away. This minimum is set to ensure the DUT is in the far-field of the antenna’s radiated field. Near-field emissions are much more complex and difficult to accurately generate, so a high-level far-field emission is used as the standard. A successful test occurs when the product is completely unaffected under the most extreme test scenario. According to the FCC, every device that has electrical oscillations above 9kHz needs to be tested to verify conformance. This includes any traces on a circuit board or even a microcontroller that oscillates above 9kHz but doesn’t have high frequency traces. Also, if a product integrates an FCC certified module, such as Bluetooth, into a larger assembly, that entire assembly may still need to be tested. Depending on if the tests pass the first time, the entire process for certification can take less than a month. However, as there may be problems, particularly with smaller companies with less experience with EMI, the process can take considerably longer. When a device successfully passes the tests at an accredited testing facility, the facility will generate test reports and other paperwork as required to prove conformance and submit to the FCC, if necessary. The appropriate markings, statements, and FCC ID, if applicable, are then placed in an easily accessible and viewable portion of the product. EMC can be a confusing and intimidating topic to tackle; however, the legal, economic, and performance ramifications of compliance can be extremely significant. It is imperative that you seek further information from an authorized EMC testing company as you start your design process. Fortunately, by being aware of the issue and knowing the overall process, you have started in the right direction to making sure your products are ready for the marketplace. Are you interested in more advanced topics like this? Read our eBook: Advanced Topics for the Knowledge Hungry.